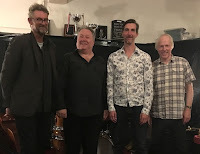 Alan Law (piano); James Birkett (guitar); Paul Grainger (bass); Russ Morgan (drums). (Review by Russell/photos courtesy of Roly V). A second set only review. 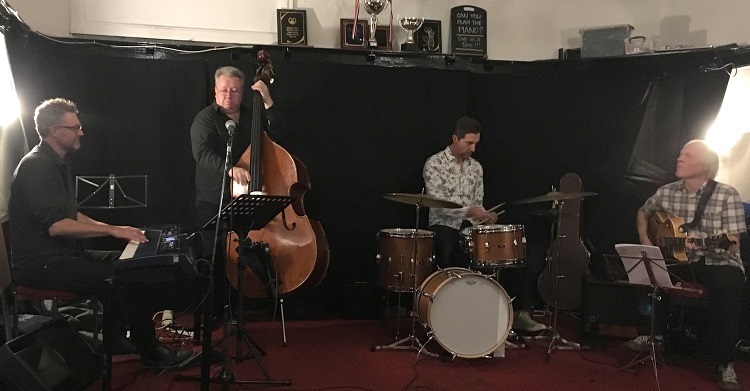 An advance ticket purchase dictated your correspondent's early evening whereabouts - Polly Gibbon's gig with the Strictly Smokin' Big Band at Hoochie Coochie - resulting in a late arrival at the Black Bull. Blaydon Jazz Club's September concert presented the Alan Law Trio working with a much-loved friend of Blaydon, master guitarist James Birkett. Arriving in time to hear the final number of the first set - Lady Be Good - it was good to see a good number of folk had made the effort and, encouragingly, a few new faces. Hey, Lady be Good, a cookin' rhythm section with Birkett flying, a pretty good way to tune out of roaring big band mode and adjust to a small combo. Second set: Lulu's Back in Town for starters, Blue Bossa* then a timeless ballad - I Fall in Love Too Easily. Pianist Alan Law plays, as they say, with a feelin'. Finding a way, choosing a chord, liking a phrase, Law's solos develop out of seemingly very little, the nurturing of an idea. And the man to take it on, Dr.
James Birkett, did just that. The boys at the back, Paul Grainger sounding better than ever, and in-demand drummer Russ Morgan, made incisive contributions, a compatible quartet if ever there was one. And that was about it but not before they jumped aboard an A Train. Next month - Sunday, October 19 - James Birkett returns to play a gig with fellow guitarist Bradley Johnston. If you love jazz guitar don't miss this one. * In introducing Blue Bossa Alan Law said it was the first jazz tune he learned to play properly. In so doing Law inadvertently stumbled upon as good an answer as any to the question: What is jazz? Hopefully, you can play the tune as well as you hum it walking along the street.